It's all my fault. I asked, you voted, The Guy was even persuaded by the power of democracy not to use his super delegate status and changed his vote from the Red Crackle vessel sink to the Red & Black, which was my favourite too. But something didn't seem quite right. I spent all my free time haunting bathroom and home improvement stores trying to catch a glimpse of the four nominated vessel sinks. At Expo I was able to see the Red Spiral and it was way too modern for our space. 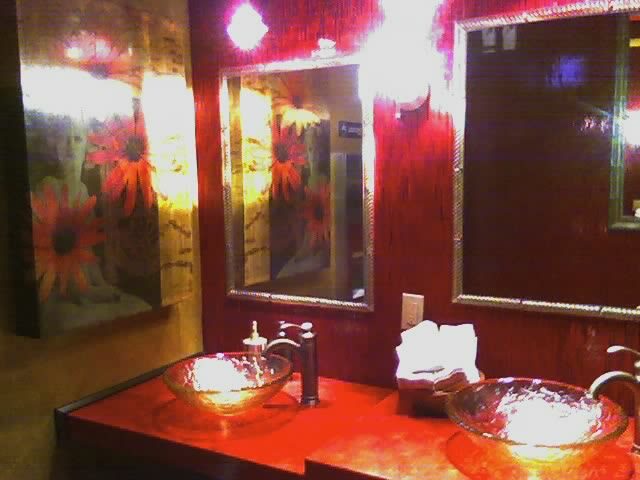 I was also able to look at a black version of the Red Marble sink but it seemed weird to simulate marble in glass. It just didn't gel. Nowhere on my travels could I find either the Red Crackle or the Red & Black. 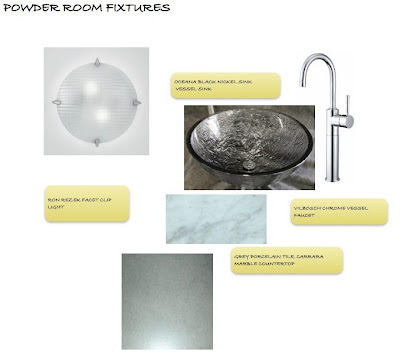 I was getting desperate and just about to order the latter when it occurred to me to make a template of the vanity so I could better imagine the sink in situ. That's when I worked out what had been bothering me. The Red & Black vessel sink was 18" in diameter, the vanity top is a trapezoid 25"x33.5"x33"x11". The sink was just too damn big. I don't know how this happened, after all I'd measured it twice. I knew the dimensions, but I'd been so caught up in the colour and pattern I just hadn't envisioned the actual space. The Red Crackle sink is 16 17/18" and for about 30 seconds I thought that would work. Then I came to my senses, dumped the whole splash of colour concept (that will have to come from the hand towels) and looked for something 15" or less. Guess what? There's not a lot out there. But there was one company that makes a glass vessel sink. One that I'd seen before, that was, in fact, the original inspiration for this room. 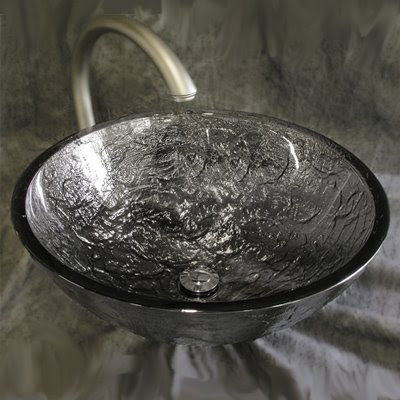 The 15" Oceana Black Nickel Glass Vessel Sink. It fits, it's in stock, it was on sale. And so, dear readers, I bought it. When it's right, jump on it. We almost did the same think with a really cute clearance vanity at Home Depot... we talked ourselves out of it due to the money, but three days later I realized it was 2x too big for the space! I'll never vote again! Just kidding. I like the sink choice.